Kimi Raikkonen has always been his own man, and when he tired of F1 in 2009, he set off for a two-year sabbatical. AUTOSPORT looks back at his rallying, NASCAR and sportscar adventures. The Iceman became the Snowman pretty quickly. Shortly after starting his very first event with the Citroen C4 WRC in 2010 – the Arctic Rally in Finland, a warm-up for Rally Sweden – spectators were treated to the surreal sight of the 2007 Formula 1 world champion digging his own car out of a snowbank. That would never have happened at Ferrari. But it was a skill that Raikkonen was to practise again on Rally Sweden itself a couple of weeks later, where the icy stages also take no prisoners. The man who Sir Stirling Moss once described as “the fastest driver in the world” turned out to be a dab hand with a shovel as well. 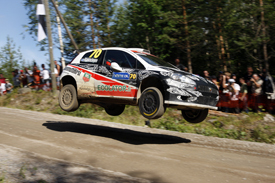 Of course, this was far from being Raikkonen’s first foray into world rallying – that took place on his home Rally Finland in 2009, at the wheel of a Super 2000 Abarth Grande Punto. He was straight into the top three, fighting with future Intercontinental Rally Challenge and Super 2000 champion Juho Hanninen and Anton Alen, a former 1000 Lakes Group N class winner and son of rally legend Markku. Kimi is very close to the Alen family – one of his houses in Finland is just across the road from Markku’s – so he probably picked up a few tips. Raikkonen undoubtedly felt his stunning performance in Finland would translate seamlessly into something similar in the World Rally Car category. Plenty of others thought exactly the same. But being competitive in the Super 2000 class is one thing, taking on Sebastien Loeb in the same car is another. It only took him three WRC events to finish in the points (with eighth in Jordan), and on the following round he scored what would remain his best result: fifth in Turkey. That event, as Europe lay beneath an ash cloud that grounded aviation, was the prelude to an interesting journey home for most people. Apart from Kimi that is, who somehow managed to persuade his pilot to take off. He was relaxing at home before most of his Citroen colleagues had thought about boarding their coach back to Paris. It took them three days. There were some low points as well. Raikkonen let out an unmanly yelp as his car went off the edge in El Cubilete, Mexico, followed by a string of words that are unprintable but extremely amusing. While Kimi’s co-driver Kaj Lindstrom no doubt got sick of a scene acted out at hotels around the world most mornings – every Citroen driver (bar one) sitting patiently in the minibus, waiting to leave, while Lindstrom frantically called Kimi’s room from reception – Loeb was quite chuffed. “It’s good, because normally it’s me who is late,” he pointed out – directly from the minibus. Kimi’s first and only fastest stage time came on the 2010 Rally Germany’s Circus Maximus, a spectator superspecial around the Porta Nigra – an ancient Roman gate – in Trier. For his second season in the WRC, Raikkonen’s budget was significantly reduced, forcing him to go with his own team – Ice1 Racing – in a Citroen DS3 WRC funded by a variety of private sponsors. He didn’t complete a full season, tackling nine events in total with a best result of sixth in Jordan and Germany. Under the WRC Team rules, he was obliged to contest two events outside Europe, and his decision to skip Rally Australia because it was “a long way” fell foul of that regulation. Unsurprisingly, the Australian stewards did not accept the geographical location of their event as a mitigating circumstance and Ice1 Racing was excluded from the teams’ championship (although Raikkonen finished 10th in the drivers’ standings, for the second year running). Then came the call to Lotus, but Kimi doesn’t think he would be where he is today without his two years in rallying. Raikkonen might not have had the results he wanted in the WRC, but he brought some real star quality to the championship with an army of passionate fans. With his rallying sojourn fraying at the seams, Raikkonen spent a month in the US in 2011, running two tests and two races with Kyle Busch Motorsports. His first experience of NASCAR-style machinery came in a truck test at the half-mile Gresham Motorsports Park oval in Georgia. And it didn’t take long for Kimi to make an impression on the team. “A lot of time when we test, the driver will go out and mosey around for a couple of laps to get their bearings and get familiar with the racetrack,” says KBM team manager Rick Ren. A further test followed at Rockingham, before Raikkonen made his Truck Series debut around the 1.5-mile Charlotte Motor Speedway. 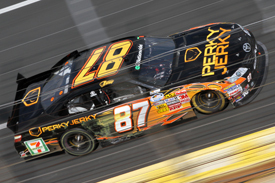 Kimi finished 15th and a week later contested the Nationwide race at the same track in a car run by KBM, but entered by Joe Nemechek’s team. “The truck race didn’t go as good as I hoped it would, but the car race was going very well until he had a pitroad speeding penalty,” Ren recalls. “I was really impressed during the Nationwide race. Our car was not nearly as good as what it could have been, he was driving the wheels off that thing and doing a very good job. “When he first came here I looked at his shoes and I told him, ‘I don’t think you’ll be able to run those shoes over here’ and he’s like, ‘Yeah, yeah, yeah that’s what I always race with’, so he didn’t want to put the heat shields on. The floorboards get exceptionally hot in NASCAR vehicles, maybe 125-130 degrees. 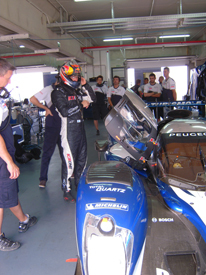 Peugeot motorsport boss Olivier Quesnel had long since promised Kimi Raikkonen, then competing in World Rallying with sister marque Citroen, a go in one of his 908 HDi LMP1 turbodiesels and duly delivered in August 2011. Quesnel, who was in charge of both marques, always denied that there was anything more to the test, but insiders insist that an outing at the Le Mans 24 Hours was discussed at some point. And quite rightly so after Raikkonen’s performance during his short try-out at Motorland Aragon. “Kimi was quick straight out of the box,” says one of Peugeot’s retinue of drivers. 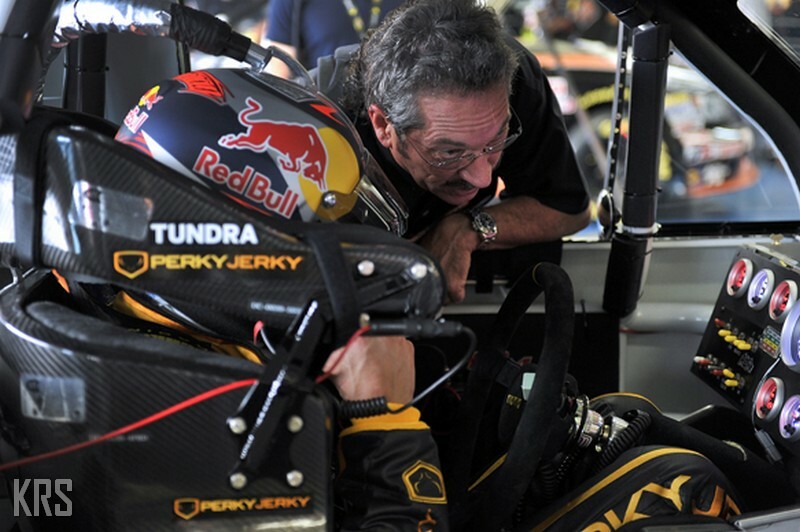 “He got in the car and matched the quickest time of the test inside four laps. Raikkonen apparently liked the car, apart from its powersteering, but any chance of a race outing as good as disappeared three months later when it was announced he’d be returning to F1 with Lotus. And then it disappeared for good when Peugeot called time on its sportscar programme another couple of months after that.